The warp core and antimatter pods are the most dangerous objects carried by a starship. The warp core ejection system is designed to prevent the starship from being destroyed if the core takes damage that compromises its structural or safety systems. When the command crew or the main computer automatically orders the warp core to be ejected all fuel supplies are automatically cut off from the warp core. 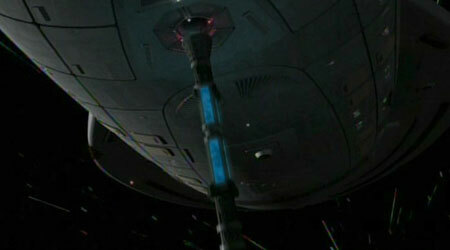 A series of force fields is then established to isolate the core for the rest of the ship. The hull plating on the bottom of the secondary hull is then detached followed by the warp core being ejected by explosive charges; the antimatter pods may also be ejected. In combat situations the core can be remote detonated when the ship is clear from the blast wave. If the core is salvageable the ship can return when the core has stabilized. Ejecting the warp core will leave the ship without warp capability possibly thousands of light years from help and leave the starship extremely vulnerable to attack.